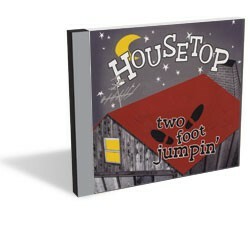 Two Foot Jumpin’, a new CD from Housetop, is chock-full of swingy, up-tempo music. The quartet hails from southern Vermont and northwestern Massachusetts and is fronted by Peter Siegel, a respected dance musician in the vicinities of Greenfield and Northampton. The band is named after Piedmont bluesman Leroy Carr’s jugband classic “Papa’s on the Housetop, Won’t Come Down,” which is included on the disc. The recording’s primary flavor is vocal, courtesy of a trio of female voices singing in close harmony with Siegel, a string man who sounds like he’s having way too much fun throughout. Two of those lovely, high voices belong to sisters Naomi and Erica Morse, who also play fiddle and acoustic bass, respectively. The third voice, and so much more, belongs to the very busy and extremely musical Anna Patton. Patton is like Dan Hicks and the Hot Licks meets Ms. Artie Shaw. In other words, the ace clarinetist is stellar. It may be wrong to long for more clarinet parts on this recording, given that the vocal blend is “the thing” here. But that horn sure sounds fine! In fact, if there is a downside to Patton’s amazing ability, it’s that most of the other instrumental work on the album seems a bit dull by comparison. Housetop tackle material by some historically significant musicians and composers, including Irving Berlin (“What’ll I Do?”), the Ink Spots (“Do I Worry?”) and Fats Waller (“Your Feet’s Too Big). The disc also features originals by Siegel, central Vermont songwriter Colin McCaffrey and Ben Patton — Anna’s brother and yet another talented offspring of Vermont gypsy-jazz pioneer Will Patton. While Two Foot Jumpin’ surfs the edges of jazzy swing and Ink Spot jive, it lacks that hint of grit that makes recordings of historical material sound like they could be “the real thing” come back to life. Think Lucinda Williams, Sheesham and Lotus — a duo that sounds as though it climbed out of a moldy house built from ancient 78s — or bluesman Paul Geremia. In spite of this relative politeness, Two Foot Jumpin’ has lots of musical fun and sounds like a true labor of love. Housetop play a few shows in northern Vermont this week, including at the North End Studio in Burlington on Friday, June 17; a house concert in Burlington on Saturday, June 18 (visit the band’s Facebook page for details); and at the Bee’s Knees in Morrisville on Sunday, June 19.